In the animal kingdom, fall is all about one thing: preparing for the harsh winter months ahead. After the fall equinox on September 22, we humans would be smart to follow their lead. A detoxifying cleanse will strengthen your body for the major changes in climate and lifestyle that we make each year as winter approaches. Ayurvedic and Chinese traditions and most indigenous societies incorporate cleansing in the spring and the fall into their life styles. Europeans embrace the concepts of cleansing regularly. In this country, conventional medicine has been slow to appreciate the healing power of cleanses. Fortunately, things are changing. Ayurvedic fall cleanses are not so much to remove toxins as to prevent the body from building up toxicity during the coming winter months. This is a cleanse designed to strengthen the digestion and cellular metabolism in order to best create and maintain healthy tissue. Read more about Ayurvedic cleanses here. Fall in Chinese medicine is the time of the metal element, with emphasis on the mind and breath. The lungs and colon are spotlighted during this time, serving to take in vital energy from the harvest and release what is not needed. Read more about Chinese fall cleansing here. Naturopathic and integrative medicines honor these traditions and take it a step further. Naturopathic physicians recognize that the body has an innate ability to self-regulate and repair itself. However, in 2012 it’s easy for the body to become overwhelmed by environmental toxins, processed foods, chronic stress, pharmaceuticals, an imbalance in the healthy germs that live in our gut, and unrecognized infections. Depending on your genetics, nutritional status, health of your immune system, and whether you have a fragile or a strong nature, you may be unaware of these toxic influences or you may develop chronic illness. Many people simply will not have the energy, mental clarity or reserve that they used to. Cleansing at least twice a year will help to restore your body’s healthy balance. A fall cleanse will strengthen your cellular metabolism where all health begins. The cleanse will remove toxins that compromise the optimal functioning of your cells. It will also enhance your liver’s ability to detoxify toxins and your intestinal tract’s ability to eliminate toxins. This cleanse will strengthen your digestion and restore a healthy balance of health enhancing bacteria in your gut. All cleanses use a combination of fasting, restricted diet, supplements, exercise, massage, water intake, and colon cleansing. Sauna, chelation for heavy metals, emotional cleansing, and many other aspects of cleansing will not be reviewed in this article. The fall cleanse utilizes foods that naturally are available in the fall and addresses parasites that may have taken up residence in your body while playing or working outside in the summertime. Fasting: Start the cleanse with a lemon water or juice fast to revitalize your digestive system by allowing the liver to take a break from digestion and focus its energy on cleansing the rest of the body. While this can be a helpful component of a cleanse, ask your doctor, dietician or nutritional practitioner for guidance beforehand. Or read 7-Day Detox Miracle by Drs. Bennett and Barrie. A common mistake is fasting for more than two days without adding protein back into the diet. When fasting, the liver doesn’t have to process food from the gut. It’s able to use its entire detoxifying capacity to cleanse toxins from the blood that flows through it. BUT, the enzymes in each liver cell, which actually perform the detoxification process, are made of proteins. In a sense you burn through these proteins over a two-day period. So, add a protein shake made of rice, hemp and/or green pea protein back into your diet after 48 hours of a juice fast. This is different from Ayurvedic and Chinese traditions. Since we live in a polluted world and we are polluted people, it is a necessary modification to traditional water or juice fasts. Restricted Diet: After the two-day fast, you may incorporate a variety of fall vegetables, some fall fruits, cooked rice, and warming spices into your diet for another five days. You may extend the cleanse beyond this if you like. The best diet for a fall cleanse is one that is that is light, fiber-rich, unprocessed and well spiced. Cooked vegetables are easier to digest. Roasted beets and sweet potatoes are an especially nice combination if you are leery of beets. Beets are one of the best foods to nourish your liver and relieve constipation. Juicing raw vegetables and fruits make them more easily digested. “Whole” juicing in a strong blender increases the fiber and nutrients compared to traditional juicers. Olive oil enhances detox. One ounce of olive oil and one ounce of lemon juice combined and shaken together (think: salad dressing), then consumed 30 minutes before breakfast are an excellent stimulant to produce and release bile. If you’re adventurous, an Ayurvedic dish--kichadi--is made from basmati rice, mung dal, vegetables and spices. It's light and easily digested, but it also meets most of your nutritional needs. Do not stop your protein shakes while in this phase of the cleanse. One to three servings a day will help you avoid a healing crisis. Again, our livers need all the help they can get when trying to detoxify our polluted bodies. No caffeine, alcohol, wheat, sugar, processed foods, heavy meats, dairy, food additives, corn, eggs, nuts, chocolate, coffee and black tea. Yes this is tough. And it’s worth it. And it is only for a total of seven days each fall. Supplements: You can support your fall cleanse through common herbs, like those in your kitchen cabinet, as well as with doctor-recommended herbal supplements. Fennel, ginger, cardamom, cinnamon, cumin and turmeric will enhance digestion and liver detoxification. Cook with them or take them in pill form. Take a good multiple vitamin pill with minerals and antioxidants. Take extra vitamin C 500mg 3x/day. Milk thistle, alpha lipoic acid, and n-acetyl cysteine (NAC) all support the liver detoxification process. If you can’t take a multi because it causes nausea or queasiness, at least take activated charcoal, vitamin C 500mg and milk thistle capsules three times a day. Charcoal binds toxins in the bowel. Vitamin C helps to protect the body from toxins as they move from storage depots in your fat and other organs toward your liver. Milk thistle enhances production of glutathione: your body’s most plentiful and powerful antioxidant and detoxing agent. Lastly, rebalance the germs in your gut by taking a variety of probiotics. Around 25-50 billion CFU daily are appropriate during a cleanse. Lactobacilli live in your small bowel and Bifidobacterium live in your colon. If you’re adventurous, try making your own fermented foods, which have enzymes and Lactobacilli. Visit www.tasteofhealing.com for more information on this. Many other herbs or supplements are helpful in certain circumstances. For example, black walnut hulls, wormwood and cloves are needed if parasites are suspected. Exercise: During a fall cleanse, exercise daily. Ideally, you should break exercise into two periods: stimulating morning exercise and restorative evening exercise. For example, taking a brisk walk every morning and practicing calming yoga before bed each night is a great routine for a fall cleanse. However, you can choose whatever activities work best for you. Massage: Massage has an important role in cleansing. During the cleanse, your body's purification systems are being activated—your digestive system is alkalizing and removing toxicity and your liver is purifying your blood and clearing lymph. Massage assists this process. For the treatment to be most effective, have a massage performed by a professional massage therapist. This also helps you relax and recharge mentally. However, if that's not an option, ask a friend or do self-massage as a helpful alternative. If you're massaging yourself, work from your toes and fingers toward your right collarbone. Or use a dry brush on your skin to mobilize lymph. Water Intake: Adequate water is critical to a cleanse. Drink approximately one ounce of water for every two pounds of body weight. A 150-pound person should drink about 75 ounces of water each day. This includes water in soup, juices and teas. Colon Cleansing: This can be accomplished from the top down or bottom up. Anyone who has had to prep for a colonoscopy knows it is possible, though not pleasant, to “get cleaned out.” Gentler bowel stimulants like senna or magnesium oxide are available. Sometimes enemas or colonics are needed to release accumulated waste from the bowel. Coffee enemas are especially helpful to support the liver in its detox function especially if it gets overwhelmed in the cleansing process. This may happen if you do not take the recommended supplements, maintain excellent hydration, or have more toxins to eliminate than you realized. You may experience headaches, fatigue, pain, brain fog and other symptoms. If this happens, drink one to four glasses of lemon water and take three to six activated charcoal capsules. Wait for 30 minutes. If you're not better, take a coffee enema. Overall, increase your protein shakes. Get professional care if you do not feel better with rest in 24 hours. If you plan to undergo a fall cleanse, talk to your doctor first. Cleanses aren't recommended for everyone—but they are beneficial for most people. If you'd like customized recommendations for a cleanse, contact my office at (336) 808-3627, extension 13, to request a consultation. Also join us on October 25 for a free seminar on on fall cleansing at Vaughan Integrative Medicine. When former National Football League (NFL) linebacker Junior Seau committed suicide earlier this year, the immediate speculation was that his depression and ultimate death were due to the numerous concussions he received during his playing years. While this connection is still being studied by scientists (and may, in fact, be aided by the donation of Seau's brain to research), one thing is certain: concussions are an all-too-common, and sometimes fatal, occurrence among those who participate in sports on a regular basis. There are about 300,000 sports- or recreation-related concussions diagnosed in this country each year. This doesn't seem alarmingly high until you consider that nearly 85 percent of concussions go undiagnosed. The statistics get scarier when you realize that teens are a high-risk group for the brain injury. The National Center for Injury Prevention reports that 45 percent of high school football players get a concussion during a season of the sport; 35 percent get more than one concussion in the same season. There is much being done through both regulation and research to prevent concussions, but there's an important option for people who have already experienced one or more concussions: mild hyperbaric oxygen therapy (mHBOT). In many of these cases, increased oxygen can help return the brain back to its normal functioning and eliminate the symptoms of concussion or post-concussion syndrome. mHBOT is a natural therapy that can achieve such results by introducing more oxygen into the body's cells. To understand mHBOT, consider a can of soda. During the manufacturing process, the can is put under extra pressure so that more carbon dioxide can be dissolved into the soda, keeping it carbonated. When the can is opened, all of that pressure is released and the carbon dioxide begins dissolving. If left to continue this process, the soda will soon become flat. This phenomenon, which occurs when an increase in atmospheric pressure allows more gas to be dissolved into a liquid, is known as Henry's Law of Physics--and believe it or not, it also applies to oxygen therapy and the human body. 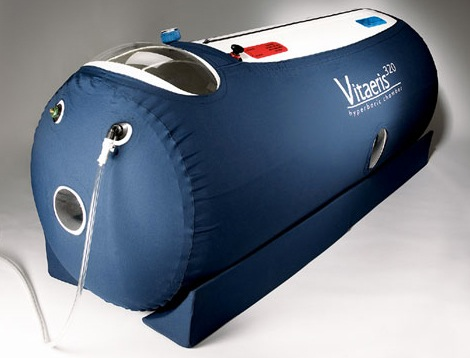 mHBOT, which occurs in an inflatable chamber, allows for increased atmospheric pressure on a person‘s body. Plasma (the liquid part of blood), cerebral fluid (fluid surrounding the brain and spin cord) and synovial fluid (fluid surrounding joints) dissolve more oxygen when the body is under this pressure. While I’ve talked about how mHBOT can help brain injuries, its applications are nearly unlimited. It’s great for the treatment of acute sprains, strains and injuries; post-surgical recovery (mHBOT is widely used after cosmetic surgeries to improve results and speed healing); infections; traumatic brain injury; and many chronic diseases. It speeds up the healing of new bone fractures and helps “non-union” fractures heal. In particular, mHBOT is an important therapy for neurological conditions like cerebral palsy, multiple sclerosis, stroke and autism. But it can also be useful in treating a number of different disorders. For example, mHBOT can help the heart rest and rebuild when it is recovering from congestive heart failure. If mHBOT is used before a workout or game it enhances athletic performance. If it is used after a strenuous event it speeds recovery. mHBOT is also a useful method of detoxification. Within about two weeks of therapy, it can jumpstart the liver detoxification enzymes (such as superoxide dismutase) that break down inflammatory proteins in the blood. Because it is beneficial in the treatment of so many conditions, mHBOT is often a great adjunct treatment for a particular disease or disorder. Chronic fatigue, angina, pre and post cardiac bypass surgery, congestive heart failure are some of the “off label” uses for mHBOT around the world. “Off label” means that insurance rarely covers these treatments. Hopefully this will change as people and insurance companies realize the healing power of mHBOT. In addition, there are many therapies that enhance the results of mHBOT. These include: food allergy testing and treatment, holistic nutrition planning, pharmaceutical-grade supplements, detoxification support and acupuncture. While something like a hyperbaric oxygen chamber might sound scary and futuristic, mHBOT is really a safe, pleasant experience. The inflatable chamber is filled with compressed, ambient air or air that is supersaturated from an oxygen concentrator. The pressure increases equivalent to 11 feet below sea level. It’s this increased pressure that allows the body to absorb more oxygen. While mHBOT isn’t dangerous, the patient does have the ability to communicate verbally and visually with the doctor and staff outside of the chamber. A patient also has the option of depressurizing and opening the chamber from the inside should he or she become uncomfortable for any reason. The primary discomfort experienced during mHBOT is pressure in the ears. This sensation can be easily abated by sitting upright and turning your head side to side, yawning and stretching your mouth open, or mimicking blowing your nose while you clamp your nose. Patients who are prone to claustrophobia may feel a little anxious during their first session. Wearing loose clothing can help keep some restrictive feelings at bay. Typically, however, time spent in the chamber is relaxing. During a 60-minute session, many people choose to spend the time listing to their iPod, talking on their cell phone, playing handheld games, watching movies on a portable DVD player, working on their laptop, or reading a book or magazine. Not only is this an opportunity for down-time, but once you emerge from the chamber, you’re likely to feel quite refreshed! It is possible to experience a few mild side effects after your first couple of mHBOT sessions. The main one is slight fatigue. This is because the body is sweeping itself clear of toxic debris as part of the oxygenation process. As your sessions increase, any side effects you experience will diminish. You should consult with your mHBOT provider to see how many sessions will benefit your particular condition. Because of its effectiveness, many well-known athletes and sports franchises are employing the treatment of mHBOT in concussion recovery as well as physical therapy. At least 12 NBA (National Basketball Association), NHL (National Hockey League) and NFL teams offer the treatment to their players. Fortunately, you don’t have to be a multimillion-dollar sports star to get the benefits of the therapy. Nor do you even have to be an athlete. mHBOT is available at many complementary care centers across the country, including Vaughan Integrative Medicine. Call (336) 808-3627, (extension 12) for a no-obligation consultation on whether the therapy is right for you.